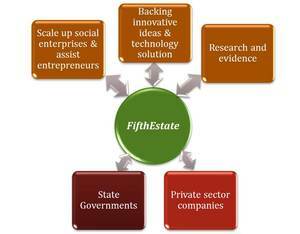 FifthEstate aims to bridge the gap between innovation, technology and the policy support of the government. It is driven by the idea of social change and aims to create an ecosystem of social enterprises and social entrepreneurs working towards solving the problems of society. Support us as we attempt to achieve impact. 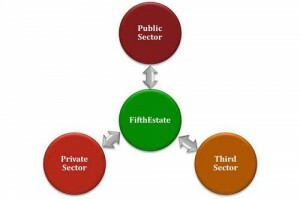 FifthEstate is a non-for-profit, independent and neutral organization with a purpose to advance social entrepreneurship through policy intervention. It aims to foster entrepreneurs as an important catalyst for societal innovation, progress and development. Starting its operations in Uttar Pradesh, FifthEstate aims to operate in different states in India and also in other developing nations, expanding the model of social entrepreneurship led growth. FifthEstate believes that in a developing nation, the impact of any social enterprise can be maximized when it gets support from the private sector and public sector. While on one hand, to be able to reach the masses and provide the last mile reach to a social enterprise, the channels of the administration of the government is the best means, on the other hand, private sector can play an important role in ensuring its growth and sustainability. Thereby making an intereing and strong partnership of three sectors – Public, private and third (social enterprise). FifthEstate is an innovative, first of its kind model in India, which is striving to build such partnerships by facilitating collaboration between public sector, private sector and the third sector. o Evaluation activities: FifthEstate evaluates the already running impactful social enterprises and submits its report to the government along with its recommendation to provide support under existing policy in the relevant sector. o Policy intervention services: For a new impactful and innovative social enterprise, FifthEstate works with the relevant department to create a policy recommendation to the government, under which the required support can be provided to the social enterprise. o Advisory support: Using the combined experience of our advisors and partners we also provide an understanding of cultural and social norms on the field to the entrepreneurs, which plays a key role in tweaking the social enterprise models to cater to the problem in the best possible way. o Research Support: FifthEstate provides research and data support to both the government and also to social enterprises. o Encouraging social entrepreneurship: To encourage social entrepreneurship in the state, FifthEstate provide mentorship, focus sector expertise and incubation services to existing and budding social entrepreneurs. o Community building: FifthEstate is constantly creating a community of social entrepreneurs from around the world across the sectors. FifthEstate fosters peer-to-peer exchange of the social entrepreneurs and supports the replication of their methodologies among each other. o Connecting social entrepreneurs: FifthEstate aims to organize an yearly conference to provide a stage for social entrepreneurs, mentors, public sector leaders, corporate heads, academics, researchers, media, sector experts and activists to come together and exchange ideas and address the wider issues in the area. We aim to empower people to lead their own development by facilitating innovation in a social domain. We aspire to develop a culture where the average citizenry aspire to become social entrepreneurs and lead development through innovation and co-creation. For this purpose we make a constant effort to bring together public, private and third sector to work together for a common goal. o Extending government and corporate support to entrepreneurs aspiring to create developmental impact. o Providing social enterprises and entrepreneurs, access to people, knowledge, methodologies and frameworks, and global network. o Collaborating with social enterprises locally in India and globally to help them become high-performing organizations, providing business and technology experience to help them fulfill their missions and maximize their impact.